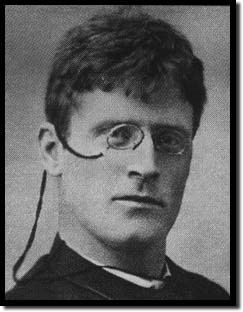 Knut Hamsun (August 4, 1859 – February 19, 1952) was a leading Norwegian author and recipient of the Nobel Prize in Literature for 1920. His most famous novel, Hunger, describes the experiences of a poor but proud intellectual who is modeled on Rodion Raskolnikov, the hero of Fyodor Dostoevsky's Crime and Punishment. Following Dostoevsky, Hamsun was a key transitional figure between nineteenth century realism and the subjectivism of modern prose, such as the irrational world of Franz Kafka. He was noted for his insistence that the intricacies of the human mind ought to be the main object of modern literature. Many modernists embraced the modern, urban culture, but Hamsun shows it to be a terrifying place, devoid of the certainties and securities of pre-modern life. He showed the darker, irrational side of "human progress" at a time when its virtues were largely trumpeted by other modern artists. Knut Hamsun was born as Knud Pedersen in Lom, Norway in Gudbrandsdal. He was the fourth son of Peder Pedersen and Tora Olsdatter (Garmostrædet). He grew up in poverty in Hamarøy in Nordland. At seventeen, he became an apprentice to a ropemaker, and at about the same time he started to write. He spent several years in America, travelling and working at various jobs, publishing his impressions under the title Fra det moderne Amerikas Aandsliv (1889). In 1898, Hamsun married Bergljot Goepfert (née Bech), but the marriage ended in 1906. Hamsun then married Marie Andersen (born in 1881) in 1909 and she would be his companion until the end of his life. She wrote about their life together in her two memoirs. Marie was a young and promising actress when she met Hamsun, but she ended her career and travelled with him to Hamarøy. They bought a farm "to earn their living as farmers, with his writing providing some additional income." However, after a few years, they decided to move south, to Larvik. In 1918, the couple bought Nørholm, an old and somewhat dilapidated manor house between Lillesand and Grimstad. The main residence was restored and redecorated. Here Hamsun could occupy himself writing undisturbed, although he often travelled to write in other cities and places (usually preferring spartan housing and conditions). Knut Hamsun died in his home at Nørholm. Hamsun first received wide acclaim with his 1890 novel Hunger (Sult). The semi-autobiographical work described a young and egocentric writer's descent into near madness as a result of hunger and poverty in the Norwegian capital of Kristiania. To many, the novel presaged the writings of Franz Kafka and other twentieth-century novelists with its internal monologue and bizarre logic. Other important works by Hamsun include the novels Pan, Mysteries, and The Growth of the Soil. Hamsun received the Nobel Prize in literature in 1920. A 15-volume edition of his complete works was published in 1954. Hamsun was a prominent advocate of Germany and German culture, supporting Germany both during the First and the Second World War. He was a rhetorical opponent of British imperialism and the Soviet Union as well. Despite his immense popularity in Norway and around the world, Hamsun's reputation for a time waned considerably because of his support of Vidkun Quisling's Nasjonal Samling (National Socialist) government. Following a meeting with Joseph Goebbels in 1943, he sent Goebbels his Nobel Prize medal as a gift. Hamsun also met with Adolf Hitler and tried to have him remove Josef Terboven from the position of Reichskommissar of Norway. After Hitler's death, Hamsun wrote an obituary in the leading Norwegian newspaper Aftenposten, describing him as a "warrior for mankind." It has been argued by supporters that his "sympathies" were those of a country that had been occupied. He sometimes used his status as a man of fame to improve the conditions of his area during the occupation and criticized the number of executions. Still, following the end of the war, angry nationalist crowds burned his books in public in major Norwegian cities. He was charged with treason for his pro-German sympathies. After the war, Hamsun was confined for several months in a psychiatric hospital. A psychiatrist concluded he had "permanently impaired mental abilities," and on that basis the charges of treason were dropped. Instead, a civil liability case was raised against him and in 1948 he was fined 325,000 Norwegian kroner for his alleged membership in Nasjonal Samling, but cleared of any direct Nazi-affiliation. Whether he was a member of Nasjonal Samling or not and whether his mental abilities were impaired is a much debated issue even today. Hamsun stated he was never a member of any political party. Hamsun himself wrote about this experience in the 1949 book, On Overgrown Paths, a book many take as evidence of his functioning mental capabilities. The Danish author Thorkild Hansen investigated the trial and wrote the book The Hamsun Trial (1978), which created a storm in Norway. Hansen was very critical of Norway for its treatment of the elderly Hamsun, writing "If you want to meet idiots, go to Norway." In 1996, the Swedish director Jan Troell based the movie Hamsun on Hansen's book. In Hamsun, famous Swedish actor, Max von Sydow, plays Knut Hamsun, while his wife Marie is played by the Danish actress Ghita Nørby. Hunger (Sult) is perhaps Hamsun's most famous work. It was published in its final form in 1890. Parts of it had been published anonymously in the Danish magazine Ny Jord in 1888. The novel is hailed as the literary opening of the twentieth century and an oustanding example of a modern, psychological novel. It hails the irrationality of the human mind in an intriguing, unique and sometimes humorous tone. Written after Hamsun's return from an ill-fated tour of America, Hunger is set in fin-de-siecle Kristiania (now Oslo). It recounts the adventures of a starving young man, whose sense of reality is giving way to a delusionary existence on the darker side of a modern metropolis. A proud young man with an inflated sense of self-importance who is stung by the humiliating set of circumstances he finds himself in, he vainly tries to maintain an outer shell of respectability, while his mental and physical decay are recounted in great psychological detail. His ordeal, enhanced by his inability or unwillingness to pursue a professional career, which he deems unfit for someone of his abilities, is pictured in a series of encounters, which Hamsun himself has described as 'a series of analyses'. In many ways, the protagonist of the novel has traits reminiscent of Rodion Raskolnikov, the protagonist of Crime and Punishment, whose author, Fyodor Dostoevsky, was one of Hamsun's main influences. The influence of naturalist authors like Emile Zola is also apparent in the novel, as is his rejection of the realist tradition. His insistence that the intricacies of the human mind ought to be the main object of modern literature. Hamsun's own literary program, to describe "the whisper of the blood and the pleading of the bone marrow," is thoroughly manifest in Hunger. His depreciation of modern, urban civilization. In the famous opening lines of his novel, he ambigiously describes Kristiania as "this wondrous city that no-one leaves before it has made its marks upon him." The latter is counter-balanced in other of Hamsun's works such as the novels Mysteries (Mysterier) (1892) and Growth of the Soil (Markens Grøde), which earned him the Nobel prize in literature, but also a reputation for being a proto-National Socialist Blut und Boden author. The novel's first person protagonist, an unnamed vagrant with intellectual aspirations, probably in his late 20s, wanders the streets of Norway's capital in a pursuit of nourishment. In four (possibly imagined) episodes, he meets a number of more or less mysterious persons, the most notable being Ylajali, a young woman with whom he has a sexual encounter. Overwhelmed by hunger, he scrounges for meals, while his social, physical and mental state are in constant decline. However, he has no antagonistic feelings towards "society" as such, rather he blames his fate on "God" or a divine world order. He vows not to succumb to this order and remains "a foreigner in life," haunted by "nervousness, by irrational details." He also plays strange pranks on strangers he meets in the streets. A major artistical and economical triumph for him is when he is able to sell a text to a newspaper, but despite this he finds writing increasingly difficult. Towards the end of the story, he asks to spend a night in a prison cell, fooling the police into believing that he is a well-to-do journalist who has lost the keys to his apartment; in the morning he can't bring himself to reveal his poverty, even to partake in the free breakfast they provide the homeless. Finally, when his existence is at an absolute ebb, he signs on to the crew of a ship leaving the city. The December 5, 2005–January 2, 2006 issue of The New Yorker has a major article by Jeffrey Frank It seems to rely on the Ingar Kolloen biography (two volumes, reportedly aggregating about 1000 pages). In English, Hamsun was never popular and remains largely unknown. His infamous audience with Adolf Hitler is recorded as largely Hamsun complaining to Hitler about the Nazi depredations against Norwegians. At this time he was a largely-deaf old man in his 80s. The twenty–first century consensus puts him in the forefront of modernists, a forerunnoer of William Faulkner and Franz Kafka. Ernest Hemingway once credited Hamsun with teaching him "how to write." Nobel Prize-winning writer Isaac Bashevis Singer was also greatly influenced by Hamsun and translated some of his works. ↑ In From the Cold, The New Yorker, 2008. Retrieved January 10, 2008. Braatøy, Trygve. Livets Cirkel. (The Circle of Life: Contributions toward an analysis of Knut Hamsun's work). J.W. Cappelenes Forlag, 1929. ISBN 8202043158 (1979 edition). This page was last modified on 21 April 2018, at 20:37.